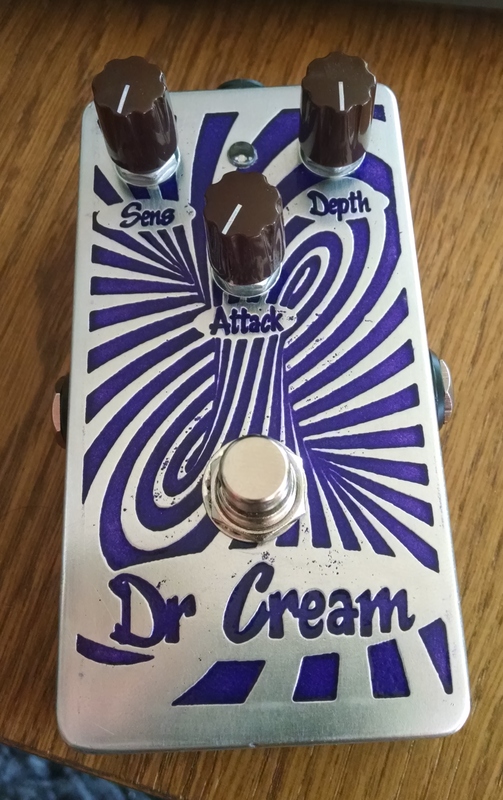 The Tube Screamer is a classic all around great sounding distortion, even though the stock circuit is not very complex, by eliminating the JFET bypass switching and utilizing true bypass you eliminate quite a few parts. Even more, you can eliminate the input and output follower stages a number of coupling caps and bias resistors. With just one op amp and less than 25 parts, you can make a tube screamer that sounds just great. In my implementation, I changed some values in the filter section to suit my taste and on the first stage I used BAT46 shottky diodes. These diodes have substantial reverse leakage- so you have to lower the impedance of the feedback pot and resistor that controls the the drive gain. That is why I used a 50k pot and 100 ohm resistor. I used the shottky because they start to clip much sooner and you can get a really insane amount of overdrive. 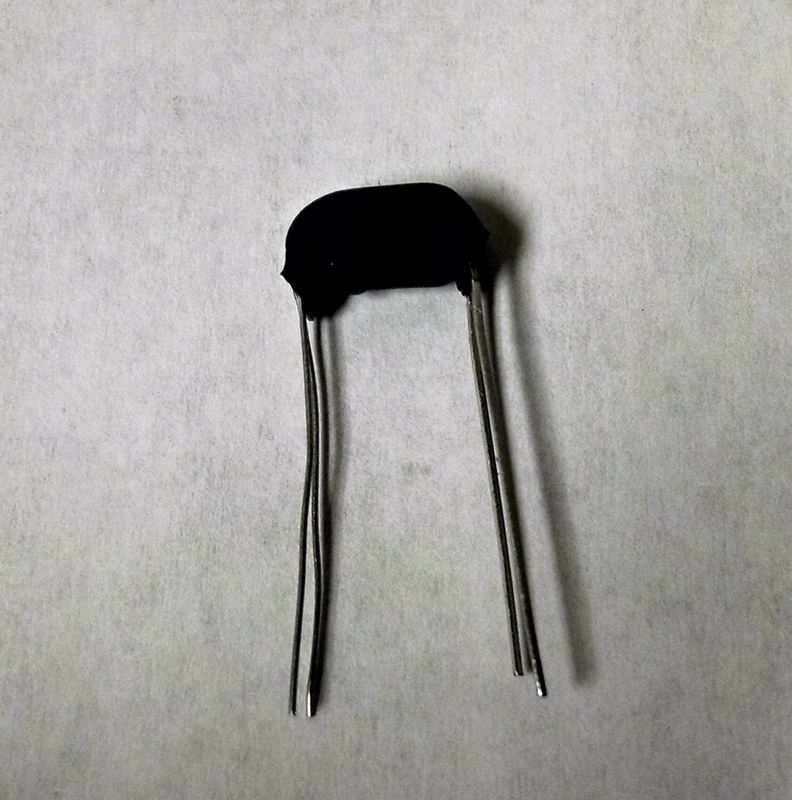 Regular silicon diodes work just fine. The original stock values can be used and can be found on the web. I designed a low pass type envelope filter using a Fliege filter topology . The result was a really easy to build filter that provides1st order low pass ..all the way up to 2nd order low pass with extreme bandpass peaked low pass(high Q, resonance…etc). I really like this pedal. I could not get a TL072 to work well in the circuit. I needed to use a higher bandwidth, rail to rail type op amp, but there are plenty of amps that work well. The OP Amps I tried were the OP213(works fine but expensive), OPA1652, and the TS922. These are all low noise, high bandwidth devices. The TL072 broke into oscillation and distorted. Maybe someone else can get it to work? I don’t have time to figure out the problem but I assume there is some sort of undesired phase shift making an oscillator out of the thing. The LDRs can be commercial units but I just built some from scratch – they were easy and cheap to make. I used flat faced green LED’s and small CDS photo-resistors. I super-glued them together and then just cover with heat shrink to make them light tight. It took me about ten minutes. 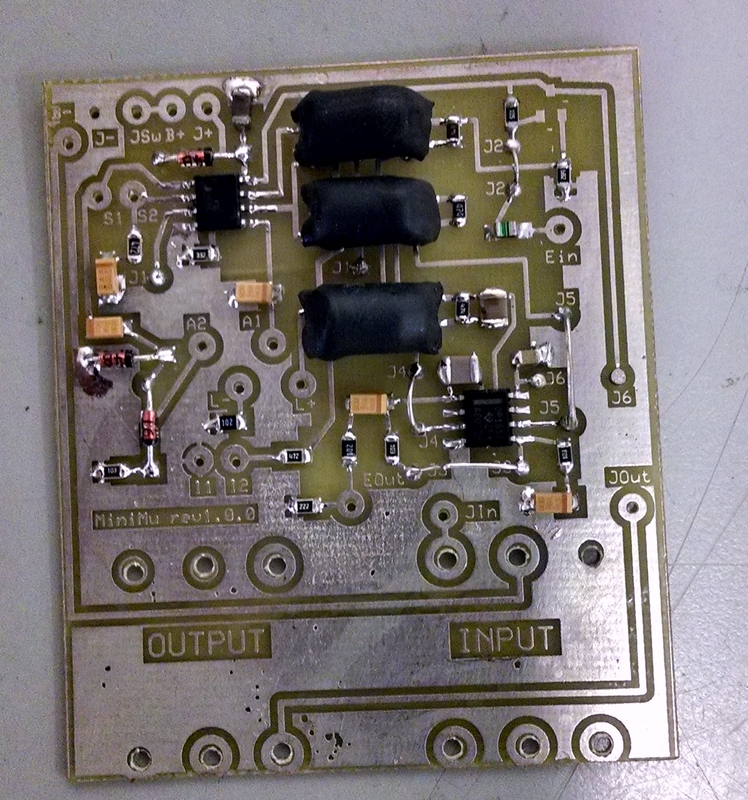 Pretty simple – A emitter follower buffers the input and provides 1/2 supply bias for the the filter op amps. The Filter uses two LDRs for the filter sweep and one more for the intensity or Q of the filter. When LDR3 is .707 the vaulue of the other LDR’s (1 and 2), you get an ideal 2nd order low pass characteristic. When LDR3 is higher you get bandpass peaking and this can be quite extreme. As the filter sweeps, the ratio between the LDRs must be the same, that is why you need the third one and not just a variable resistor. The LDRs are driven by a current mode amplifier and a simple diode peak detector. I used a LM358 for this but the the OP213, OPA1652 and the TS922 used in the filter section will also work. The design provides a sensitivity control, intensity(resonance) control and an attack control. The attack control really makes it easy to dial in the sweet spot of the filter and get very snappy or very slow plodding whah whah effects. PWM Vibrato that sounds Awesome!